MANAGUA, Nicaragua (CNN) -- Ahead of a third and possibly final round of talks between two disputed governments of Honduras on Wednesday, ousted President Jose Manuel Zelaya told CNN he was looking at other options to gain his return to power. 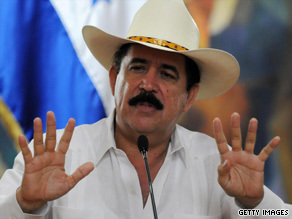 Honduran President Jose Manuel Zelaya was ousted in a military-led coup. Zelaya, who was toppled in a military-led coup on June 28, said he will publicly announce his return as early as this week. His first attempt to return, on July 5, was thwarted when the interim government that succeeded him blocked the airport runways. One man was killed in clashes that surrounded his attempted return. Zelaya wrote a letter to President Barack Obama, asking him to take stronger action against the government of provisional Honduran President Roberto Micheletti, Zelaya told CNN en Español Tuesday night. "My return is a guarantee for peace in the country," Zelaya said. Pressure for a resolution to the political standoff in Honduras has increased after the breakdown of talks between the two sides over the weekend. The European Union on Monday suspended aid to the Central American country. Also Monday, U.S. Secretary of State Hillary Clinton spoke with Micheletti by phone, warning of harsh consequences for bilateral relations if an accord wasn't reached, according to a State Department spokesman. Zelaya, a leftist who took office in 2006 on a narrow victory, had been at odds with Honduran lawmakers, the country's supreme court and the military over the referendum, which he had planned to hold last month. Congress had forbidden it and the supreme court ruled it illegal. The military declined to participate in its usual role of safeguarding the vote, saying it could not take part in an illegal act. Zelaya vowed to hold the vote anyway but was toppled before the voting started. Venezuelan President Hugo Chavez, a Zelaya ally, won a similar referendum this year, and many Hondurans thought Zelaya was trying to maneuver a way to seek re-election in November. Zelaya has denied that was his intent. Honduran presidents are limited to one term.